David Attwell defends the literary and political integrity of South African novelist J.M. Coetzee by arguing that Coetzee has absorbed the textual turn of postmodern culture while still addressing the ethical tensions of the South African crisis. As a form of "situational metafiction," Coetzee's writing reconstructs and critiques some of the key discourses in the history of colonialism and apartheid from the eighteenth century to the present. While self-conscious about fiction-making, it takes seriously the condition of the society in which it is produced. 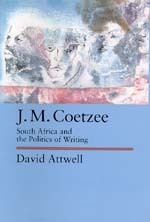 Attwell begins by describing the intellectual and political contexts surrounding Coetzee's fiction and then provides a developmental analysis of his six novels, drawing on Coetzee's other writings in stylistics, literary criticism, translation, political journalism and popular culture. Elegantly written, Attwell's analysis deals with both Coetzee's subversion of the dominant culture around him and his ability to see the complexities of giving voice to the anguish of South Africa. David Attwell is Senior Lecturer at the University of Natal in Pietermaritzburg, South Africa. Attwell is also the editor of J.M. Coetzee, Doubling the Point: Essays and Interviews (1992).